We’d love your help. Let us know what’s wrong with this preview of Breaker and the Sun by Lauren Nicolle Taylor. Breaker Van Winkle is a recently returned Vietnam vet, struggling with PTSD and the difficulties of readjusting to civilian life with his mother. Eighteen-year-old Sunny is a high-achieving Chinese-French immigrant who fled Vietnam during the war. Sunny is usual New from Lauren Nicolle Taylor, the best-selling author of Nora and Kettle, comes a fresh take on a classic tale. Published May 8th 2017 by Clean Teen Publishing, Inc.
To ask other readers questions about Breaker and the Sun, please sign up. Gah, this book was beyond beautiful. Much like its predecessor Nora & Kettle (which I also loved so, so much), it is full of postwar heartache and obstacles. It's a lovely story about Sunny, who lost her parents in the Vietnam war after an attack and is now trying to navigate life with her grandparents, and Breaker, who fought in the war and is still dealing with a lot of PTSD and lingering prejudices and is unsure of how to move forward. This book is just another example of the author's gorgeous writing and fabulous character development. I loved both characters, and felt quite deeply for them. Even as I was sometimes angered by Breaker's prejudiced thoughts, he had been through a lot, and it was clear that he wanted to do better. And Sunny was just remarkable. She had to endure these prejudices all around her, and her courage and strength in the midst of her losses was incredible. She was smart, and driven, and compassionate. I adored her loving, yet sometimes challenging relationship with her grandparents- especially her grandmother who could be quite strict and serious. But her grandfather helped bring a levity to the family that I loved. Breaker had his own family struggles, too. He had a wonderful, loving relationship with his little brother that is very well developed throughout the story, and he was dealing with parents who were... well, they weren't particularly supportive. It's something you should just read for yourself, really. You can read my review here as well! Last year, when I read Nora & Kettle, I immediately fell in love. The story was beautiful and heartbreaking and such a wonderful retelling, both unique in its execution and refreshing in its setting. 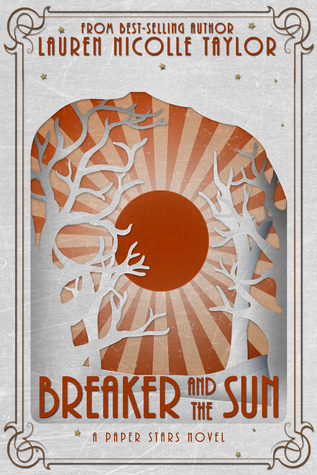 I was eagerly hoping for a sequel and I was beyond the moon when I heard about Breaker and the Sun. This book follows a new story with new characters, so you don't need to read Nora & Kettle to understand it! I really liked this book. It was a bit hard to ge You can read my review here as well! I really liked this book. It was a bit hard to get into at first because Taylor immediately introduces the tragedies both main characters faced. I hadn't planned on finding out those so soon but Taylor definitely gives readers more into Break and Sunny. She shows their struggles and how they fight so hard to overcome their pasts, to move on with the challenges that face them now. It was definitely a difficult road for these two, but they managed it and Taylor wrote their story beautifully. One of the things that stood out to me most about this book was the various types of relationships. While most were familial, there were a few outside that circle, as well. And although you don't read too much about them, I still found them amazing. My favourites, though, were the sibling relationship between Breaker and his little brother, Little Red, and Sunny with her grandparents, Ama and Gong. It isn't easy for either of them--Breaker trying to assimilate to his life again, Sunny dealing with Ama--but they were complex and realistic and the author truly did a great job with them. This book tackles two important things: PTSD and prejudice. They're both sensitive topics but Lauren Nicolle Taylor knew what she was doing. If I felt uneasy in the beginning, it was gone as I was reading the story. Taylor is masterful with her prose and I think she did justice depicting both. What can I say about author Lauren Nicolle Taylor's new book Breaker And The Sun? It's SPECTACULAR!!!!!!! I get into her books so much that I forget where I am and am easily able to put myself in the story. Not many authors can do that for me, but she is definitely one of them!!! "She is the light. And me? I’m the dark spaces between. The absence of light that gives the sun its contrast." Lauren Nicolle Taylor has a masterful talent for bringing beautiful new light into the darkest moments. Her writing is entrancing, weaving pain and dark truth into an incredible story. Two broken people, two wounded souls, one magnificent tale. I was disappointed when I started this book, believing it was a continuation of Kite and Hiro’s story - it wasn’t. It took me a while to understand the characters and the story were a completely different one. Still characterizing racism and emotional scars, but entirely different. The book was good even though not what I was expecting. Always love this author. Story and relationships develop well in this retelling of Rip Van Winkle, although I felt the ending was cut a bit short. I would have loved to have a longer epilogue where we learn in more detail how the characters futures played out. All in all, worth the read. One character suffers from PTSD because of the war. One character's life has changed forever because of the war. Both had tragic events change their lives, and now they both face the challenges of moving on. Their journeys - both together and apart - are told beautifully.